Odhum poruL anthimOpAya nishtai uraiththavanE! ஓதும் பொருள் அந்திமோபாய நிஷ்டை உரைத்தவனே! Translator's note: Grantham starts here. This anthimOpAya nishtai is spoken by maNavALa mAmunigaL. My part in this grantham is like being paper and pen which are used for documenting those words. After contemplating on the divine instructions on anthimOpAya nishtai given by my spiritual father maNavALa mAmunigaL, I, who is not so learned, have documented this for the benefit of the entire people of this world. The learned scholars will be pleased to see this work, the one who is interested in learning will be pleased and learn this subject matter. Others, out of jealousy, may insult this work, but is it so surprising that they insult this work? (It is not, since they are not matured enough to understand the glories of this subject matter). In this samsAram (material world) which is full of miseries, everyone goes around in the cycle of birth and death. It is said that the effects of our small momentary action cannot be consumed by us even in many many thousands of births (we may be killing many invisible entities in a moment - and we have to consume the effects of all those pApa karmA in many thousands of births). Also this samsAram is a very cruel place where samsAris (materially focussed people) cannot stabilize themselves to be able to remove the troubles in samsAram and free themselves. Also, they are always bewildered about the unbreakable cycle of birth and death and the effects of their karmAs. AchAryas mercifully bless such beings, remove their fear and uplift them from this samsAram. These AchAryas transform such beings who are totally devoid of any knowledge about the self (and keep thinking that they are not different from their body) and make them realize their true nature through their causeless mercy. The AchAryan identifies what is to be pursued and what is to be given up clearly and protects the sishyan truly. Such sishyas who are truly blessed have to accept the lotus feet of their AchAryan as the best path to relieve them from samsAram. This prabhandham explains that, the following are the most essential aspects to do always for such sishyas who are situated in anthimOpAya nishtai. To constantly meditate upon and glorify the AchAryan's divine form and service to his AchAryan's bodily needs - these are considered as upEyam (ultimate benediction) for an anthimOpAya nishtan (one who is in AchArya nishtai/charama parva nishtai). Translator's note: The next section in this grantham lists out many pramANams to support the greatness of AchArya's mercy followed by how a sishya should be. The images of these 8 pages are attached here. A brief explanation on this section will follow the pramANams listed. Translator's note: Since adiyen's samskritham knowledge is limited, adiyen is just translating the pramANams which are commonly referred and explained. We have very little time in our life but there are so many hurdles while trying to learn true knowledge about the self. We should be like a swan which separates milk from water and just consumes the milk. sAsthram is an ocean filled with valuable gems - but it also contains unwanted weeds, misleading entities, etc. 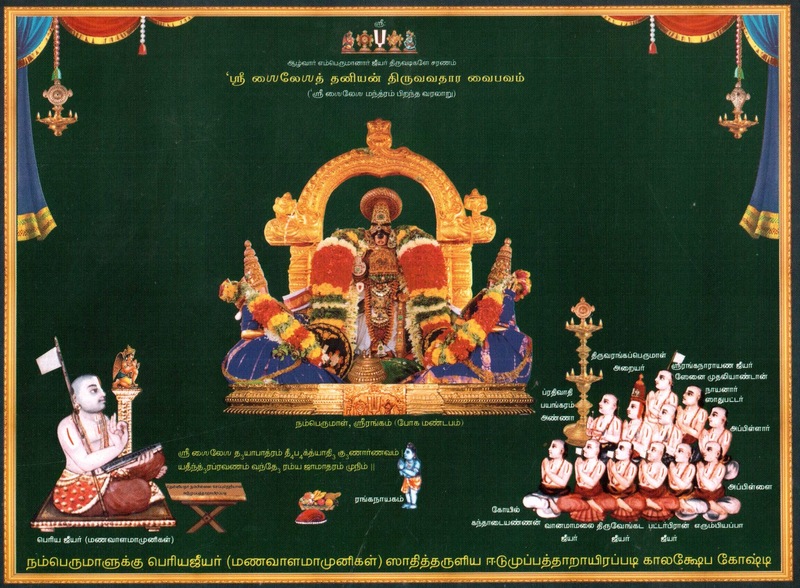 The most valuable gem is thirumanthram and its meanings that are hidden in sAsthram. True seeker of self should focus on the thirumanthram and its meanings and ignore the sections which are less important. That knowledge which leads to mOksham is true knowledge and any other knowledge that is just useful for bodily comforts are useless. Understanding the essence of sAsthram ourselves by going through various pramANams is very difficult and challenging. Hearing the essence from a learned scholar and leading our life based on those instructions is very easy to do. 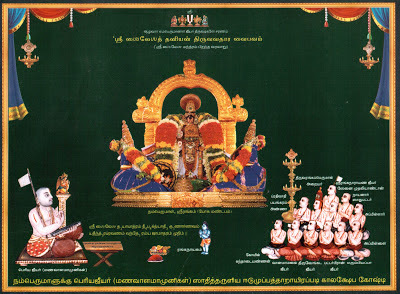 The whole universe is under the control of bhagavAn, bhagavAn mercifully allows him to be controlled by thirumanthram and thirumanthram is at the disposal of an AchAryan - thus the AchAryan is the same as bhagavAn himself. Everyone should approach an AchArya since both the abominable sinner kshathrabandhu and the pious puNdarikascha were liberated by AchAryas. AchArya is bhagavAn srIhari himself. Unlike bhagavAn who stays in the temple on his own will without any movement, AchArya is walking God. Thus, one should have complete faith on the AchArya. bhagavAn srIman nArAyaNan himself accepts a human form as AchArya to uplift the people of entire universe out of his divine mercy. When he appears as AchArya he holds the sAsthram in his hands (while he appears as himself (srI rAma, krishNa, etc) he holds asthram (weapons) in his hands). Thus, ones who are fearful of samsAram should have total devotion towards their AchAryan. An animal, human or bird, once taken shelter of a vaishNava, they are sure to attain the divine universe of srI mahAvishNu (paramapadham). Child, deaf, dumb, blind, lame, etc., when taken shelter of a true AchArya, they are sure to reach the ultimate destination of paramapadham. Even plants and trees when becoming the target of a vaishNava's katAksham (merciful vision) or touch, they are guaranteed to get mOksham - what to speak of humans? (they are sure to be relieved from samsAram). "gu" indicates ignorance, "ru" indicates the removal of such. Thus guru means one who removes our ignorance. AchArya means one who learns the sAsthram fully, explains them firmly to others and himself practises it properly. and many more pramANams are present. A sishya should glorify his AchArya in public and should give the valuable teachings in private to the ones who are interested to learn. If he/she did the reverse (glorifying AchArya in private and distributing the teachings in public without due respect to AchArya), his/her wealth, etc will diminish. A sishya must be faithful towards sAsthram, must follow his proper dharmam as instructed by bhagavAn, must be fully focussed on the goal of kainkaryam, must be surrendered to srIman nArAyaNa, must be pure, grave, intelligent and strong-hearted. Such sishyas are considered as true sishyas of an AchAryan. A sishya should offer his/her body, wealth, knowledge, dwelling place, actions, etc to the AchArya and simply live for the will of AchArya. One should give up unnecessary discussions, pride, etc in front of the AchArya. A sishya must be devoted to the manthram (that was instructed by the AchArya), the dhEvathA (the object of the manthram - bhagavAn) and the AchArya who instructed the manthram. 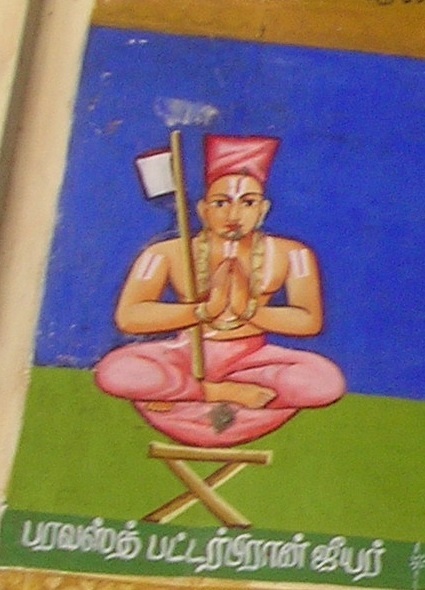 The first (lowest) category of sishyas will be more attached to the dhEvathA (bhagavAn); next (middle) category of sishyas will be more attached to the manthram; the third (top most) category of sishyas will be more attached to the AchArya who gave the manthram to medidate on bhagavAn. sishya should offer to his AchArya, that which is dear to his AchArya (not what just he wants to give). sishya should always focus on the AchArya and nothing else. The guru's words are to be discussed/followed and guru's names should always be recited/chanted. sishya should glorify the AchArya; he should offer his prayers to AchArya; sishya should always meditate and sing about his AchArya. sishya should consider his AchArya as both the means (path) and the goal - this is fully compatible with the views of sAsthram (vEdham).